That Facebook has tightened its reins with respect to reach of ‘organic’ ie. non- sponsored posts on company pages is now universally acknowledged by those closely following social media. The drastic drop in the number of “fans” who now see posts from a brand they have “Liked” in their news feed without support from paid spend has caused a stir among Facebook marketers. This dramatic change has affected both large and small brands, causing enormous frustration amongst marketers who have invested significant time and effort in organically building a fan base. Small businesses that had gotten used to the company pages as an inexpensive means to reach out, engage and interact with their target audience are particularly aggrieved. To get a sense of the frustration, check out this interesting message to Facebook from one such affected marketer- a food delivery company (Eat24)- who announced an “emotional breakup” with the social media giant. Marketers using Facebook for their social media marketing are now confronted with some fundamental questions. Has all their past effort come to waste? Are they condemned to getting disengaged users and poor reach if they do not embrace any paid-for marketing on Facebook? What can they do- if at all- to continue to get some traction from their organic marketing efforts or should that effort be allocated elsewhere? The drop in organic reach has been a subject of some concern since late 2012, though it is only in the recent past that it has assumed alarming proportions. This trend is akin to what organic search engine marketers (SEO professionals) are apparently experiencing—drop in organic search traffic and ever-more uncertainty about the potential traffic from this channel. A research conducted by Social@Ogilvy- one of the foremost digital consultancy organisations in the world- with an analysis of 106 country-level brand pages it has administrator access to found that the average reach of organic posts had almost halved from 12.05% in October 2013 to 6.15% in February 2014. Since February 2014, we suspect that there has been a further drop in organic reach going both by the campaigns we track and various reports in the media. It is obvious that increasingly Facebook is cueing all business pages to be prepared for the day when their organic reach will be zilch. Marketers are hit by a double-strike from Facebook: the steep fall in post reach on the one-hand and growing competition for limited space for organic posts on the other. The writing on the wall (no pun intended) for Facebook marketers seems clear: shell out the moolah to get a slice of precious real estate on your target audience’s FB page or risk being unseen. paid advertising/ promotions more effective and getting more marketers to use those options rather than relying on the ‘free-distribution’ channel. Their advice to marketers is to focus on the ultimate business results rather than trying to acquire fans, which is often the objective with most company fan pages. “Advertisers should think of fans as a means to an end, not as the end in themselves. The end should be business results,” said Facebook spokesman, Brandon McCormick. Are the paid advertising solutions effective? What we can vouch for unequivocally is that advertising on FB has been made much simpler in the last couple of years to get more businesses to take out their credit cards. However, the jury is still out on whether using Facebook advertising is effective in terms of driving business results (just what the FB spokesman wanted advertisers to focus on!). We’ve heard comments from cynics who call it ‘Farcebook for business’, while some others say that the precise targeting options offered by Facebook works for them. 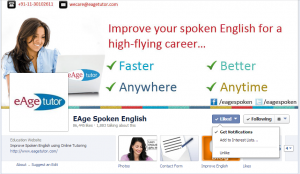 Undoubtedly, Facebook advertising appears much more affordable than print and other forms of traditional marketing. What is less clear is the success that businesses enjoy from such advertising, gauging which remains a not-so-simple exercise. While e-commerce websites are striving to sell more of their products using FB’s advertising solutions, many of them have to be content with ‘exposure’ and brand awareness; conversions still seem to be a distant attainment. Even as marketers may be swimming against the tide, it makes sense to try and extract as much juice as possible from organic reach. To do so, they will need to think carefully, critically analyze the content they are creating and sharing and re-set their content strategy. 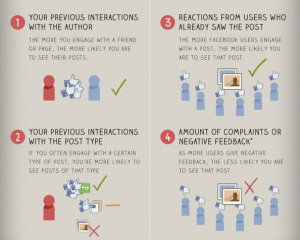 An infographic by PostRocket attempts to unlock the Facebook algorithm, which may give some essential pointers for marketers to formulate their content creation and distribution strategy on FB. As a smart marketer, you should be well aware that the solution to the declining reach is not a click or two away. It will take a sustained effort to get any degree of success in expanding organic reach. There is no magic bullet to address the problem of declining organic reach. As the above infographic shows, organic reach will be a function of a virtuous cycle: the more interactions that a particular piece of content gets from those it already reaches, greater is the likelihood of the content being shown to more people (aka, increase in organic reach). 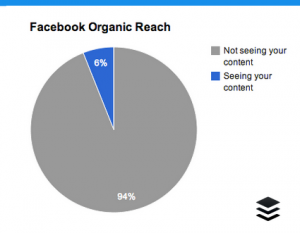 The simple mantra for boosting organic reach of FB posts? Make your posts more relevant. Find out what posts engaged more fans. If you keep the content most relevant to your line of business, you have won half the battle. Besides, time your posts right. Just as a scrumptious plate of hot lunch coming out of the kitchen would attract more interest at around 12 p.m. than at 4 p.m, interest and interaction from the audience to your content will vary with time. Determine the appropriateness of content for different time slots and you will get more interest that leads to more ‘likes’, comments and shares. Lastly, request your fans to opt for your posts by adding your page through the setting tab. An example is shown below. However, ensure to put good-quality and relevant posts unless you want your fans to opt-out of following your page. Here is another useful infographic [http://bit.ly/RuxKpl] that sums up the organic ways to thrive on Facebook, How are you dealing with overcoming the problem of organic reach? Got any other useful tips to share with the social media marketing community? Drop in your comments below!